amp followers of the British Army, commonly referred to as distaff, were family members of the officers and soldiers. These wives and daughters of officers and soldiers would have owned plain, serviceable clothes, suited for life with an army on the move. These women received half pay and half rations for services rendered, such as laundry, mending, nursing, and tending to the baggage train during troop relocations. It is known that the men rarely got paid in cash in the colonies. The Companies kept debit and credit books where such things as uniforms for the men, and shoes for their wives, etc. were debited from the soldier's pay. Women did washing for the men for pay, but in some cases, the payment was debited from the soldier’s account. The soldier’s wives employed by the Royal Newfoundland Regiment of Foot historically represent the wives and daughters of officers and soldiers of the Regiment. During performances, the distaff demonstrates period costumes and the tasks of the campfollower. 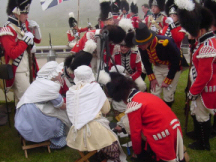 This includes setting up tent locations and equipment,and managing and mending the soldier’s accouterments. The distaff also speaks with the public about the life of the men, women, and children of the Royal Newfoundland Regiment of Foot that were stationed in St.John’s, NL 1795.